DIAL: Omega grey with red/black subcounters specially to read 45-minute intervals. Black 60-minute rotating inner bezel. CASE: 40mm, Stainless Steel cushion case, original Omega plexiglass. Crown on left to control rotating diving bezel. CONDITION REPORT: The dial and hands are mint. The case has been nicely refinished. The case back was polished and the seahorse logo is only slightly visible. Developed in the late 1960’s, the Soccer Timer consisted of a combination of a 45 minute timer and pulsometer and was designed for use by soccer trainers. A fine and rare, sought after Omega Seamaster Chrongraph, so-called "Soccer-Timer" model because of its red 45 minute recording sub-dials and high visibility orange hands. This model came in 3 sizes: The smallest with only dial and case lining up directly, the mid-size with a fixed tachymeter inner bezel and the large size with a rotating bezel. The large size had two dial configurations, either grey or white, and three inner bezel. The most common being the 60 min diver style, then the yachting bezel and finally, the most desirable version, the 24 hour so-called ‘roulette wheel’ bezel. 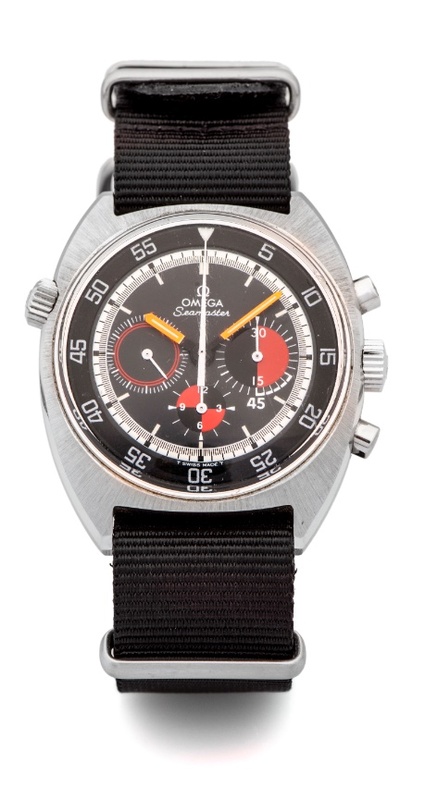 This watch is all original with the famous Omega calibre 861 chronograph movement as used in the famous Moonwatches.